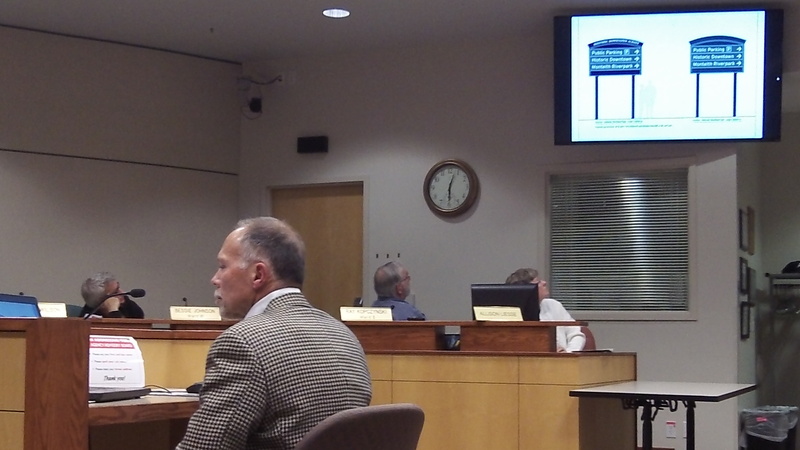 Designer Ken Ambrosini shows the CARA board what downtown signs would look like. If people have gotten lost and turned up missing in search for the sights of downtown Albany, I’m not aware of it. But just in case, the downtown urban renewal program is going to put up “wayfinding” signs. The advisory board of CARA, the Central Albany Revitalization Area, got a presentation on the project Wednesday from Ken Ambrosini. He owns a design firm in Portland. And he laid out plans for two main “vehicular directional” signs at the entrances to downtown at each end of the Lyon-Ellsworth couplet, four smaller signs along those two streets for drivers and pedestrians, and 18 signs for walkers on six intersections along First Avenue. The signs would be black, dark blue and dark green, with white lettering. The two big ones would be about 12 feet tall and eight feet wide, judging by Ambrosini’s renderings, and the others slightly less tall but much smaller in size. They would be made of aluminum, in his recommendation, and point people to places such as public parking, Monteith Riverpark and the Monteith House. Councilor Bill Coburn wanted to be sure they would also mention the Albany Carousel. Over the years points of interest could be added, as the elements of each sign would be exchangeable. There would be no logo, but Ambrosini said they would still show a “brand” for historic downtown Albany with their shape, color and typography. Now he’ll refine the plans, and eventually CARA will call for bids for someone to make and install as many of the signs as the budget allows. The program has set aside $75,000 for the wayfinding project, which has been talked about since at least 2011 when it was recommended in a downtown plan update. Ridiculous amount of money for ridiculous signage. I wonder what the ROI on this expenditure will be? By design [no pun intended], the ROI will be zero in the classic sense you imply. That is the same with the majority of URD projects – again, by design. Yes – ROI is but one of the consideratioons — and it carries more weight in a private-public partnership. The signing doesn’t fall into that. I believe that because it will help enhance the overall viability of the downtown, that will, in and of itself, help leverage the values of the entire ddowntown (and URD). While I expect they will be fine, attractive, sturdy, signs. That is 1/2 the price of a house in much of Albany! When I was attended high school in Jefferson (graduated ’81), the baseball field needed a dug-out. I had been taking drafting since 7th grade — I loved it. So I was tasked with drawing up the plans for the dugout, which was then used to build the dugout. These are signs. Could not we do something similar, where student in shop classes at West or South design and build the sign, overseen by the shop teachers? They’d get real experience and see their efforts contributing to the community. I’m sure there are regulations to be adhered to before they could be put into place on public roads, but this would also be part of the learning experience. What does it take to do such a project. Why not use this as an educational and community building experience and save money as well? GREAT IDEA, Shawn. I’ll second your motion, which as I read it, is to CANCEL any obligation to the Portland designer, and award the bid for the final designs to a LOCAL sign maker that will recirculate that money into Albany’s economy many times over. This CARA board seems like a bunch of “yes” people eager to spend the public’s money before we rescind their right to do so (or would like to). This $75K is all the proof I need to say they don’t have the prudence to spend OUR money wisely. As Shawn said, that’s half the price of an average house in Albany. I bought my first home for exactly half that price in 1990. Get REAL! Shawn- keeping the money local just doesn’t seem to happen with CARA projects. Saving money and training LOCAL youth probably won’t happen either. It just makes too much sense! If these signs get approved and constructed, the company should be required to research all points of interest in Downtown. There is more now than just the Carousel. $60k for signs to be spent WHERE? So much for helping Albany. Exct locations of individual signage TBD… Yes, they WILL help Albany. I suspect Bill was wondering why a local company couldn’t have been hired to do this work, and if he wasn’t, I AM. As Bill said, so much for “returning” local money to local businesses. This “design group” sure as hell saw the City of Albany coming! As you are well aware, by law, we cannot mandate “local companies only” to respond the the open bidding process when it happens. That was strongly suggested yesterday, but we cannot require it. I guess if you count the revenue stream from police writing tickets for “rear enders”! Just what is needed – more signs to draw attention of drivers from traffic. Albany isn’t as bad as some other cities but sign clutter is a problem that needs to be looked at before such a project goes forward. Nice idea but is it necessary and safe?????? It is necessary to do what is intended – and quantity/safety are taken into consideration. You won’t see one on every corner for sure! Ray, has it occurred to you that “what is intended” isn’t worth the price tag, and that the prudent thing to do would be for the CARA board to consider other options? You people need to get your @#$% together before you do something this wasteful of public money. My family made a living (nothing more) by doing publicly funded construction jobs. I’m not just shooting from the hip here. This is ridiculous. “Those people” are the folks who normally have not stopped to take advantage of the additional attractions and resources available – when they are heading to Corvallis or south to Junction City, etc. Their audience is not for those few the long-time locals who have already expressed their opinion they don’t go downtown. According to Woods I carry a supply of lipstick. I’m willing to let you borrow some to prettify the pig you’re selling. On second thought, I don’t think I have enough. Sorry. You’re on your own, pal. I like you in the pale pink. Matches your sweater vest.